Vocal harmonies can add gloss to a musical production, but if you don't have access to a group of first–rate session singers, does software really provide a viable alternative? If you are fed up with dealing with temperamental backing singers, or simply can't afford the session fees, Mu Technologies want to help you out. Mu Voice, their first product, is a vocal harmony generator that comes in a plug–in format for both Mac and PC. Automated vocal harmonies are, of course, nothing new, with a range of both hardware and software options available from the likes of Digitech, TC–Helicon/TC Electronic and Antares. Mu Technologies are, therefore, up against some well–established competition. Mu Voice's key feature is its intelligent four–part harmony engine. The 'intelligence' means that the engine uses a chord recognition system as the basis for the synthesized harmony voices. Preset combinations of harmony style and chord can be sequenced in sync with the DAW host via either the on–screen Chord Scheme Panel or, as of version 1.2.0 (which was released as an update during the course of my review), MIDI–based chord recognition. In either case, the engine ensures that the harmony parts are musically valid. 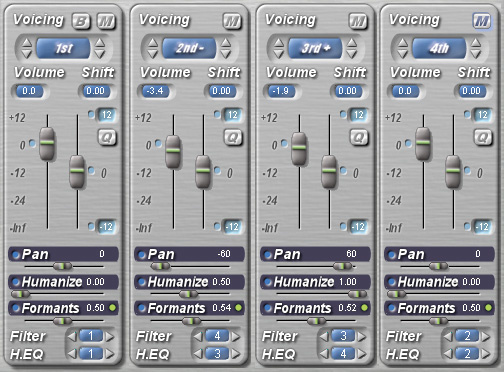 Humanise and formant controls can help the harmonies sound a little more natural, and various EQ options provide further customisation of the tonal character of each voice, while basic pitch correction is also included. Mu Voice is available for both Mac and PC in VST, RTAS and AU (Mac only) formats, and a nicely presented PDF manual is provided. I tested the PC VST version, which is a compact 4MB download. Authorisation is by iLok licence and, for existing iLok key owners, Mu Technologies will provide a limited–time licence on request for evaluation purposes. Once installed, Mu Voice is simply placed as an Insert effect upon the mono audio track containing the vocal to be harmonised. If you are using the Chord Scheme Panel (described below) for automation, nothing more needs to be done. However, if you are using MIDI control an additional MIDI track needs to be created and its output set to Mu Voice. MIDI data can then be passed from this track to the plug–in. 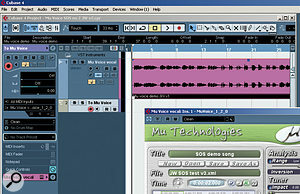 The output from a Cubase MIDI channel has been set to Mu Voice, allowing control of the automated harmonies via MIDI.All of Mu Voice's controls are contained within a single screen, split into five panels. Of the four channel strips within the Harmony Channels panel, the first is perhaps best thought of as the 'master' channel as, usually, this will control the level of the original lead voice and will not be pitch–shifted. Large mute and bypass buttons allow the lead voice to be eliminated, or heard in its unprocessed form. The purpose of some of the Harmony Channel controls, such as Volume and Pan, is self–evident, but one or two others are worth explaining. The large Voicing Display in blue towards the top of each channel strip indicates the harmony generated for each channel. Four basic settings are available here — first, second, third and fourth — and these refer not to musical intervals, but to the stacking of the harmony relative to the notes within the chord being used to construct the harmony. With the first setting, no pitch–shifting is applied. With second and third, Mu Voice uses the next notes within the chord above the lead voice to create the harmony. If the chord is a simple triad, then the fourth setting creates a harmony an octave higher than the lead voice note. However, if the chord is more complex (a sixth, seventh or ninth chord, for example), the next note within the chord is used instead. Further possibilities are provided, as the harmonies can be pitched up or down by two octaves via the arrows to the right of the voicing buttons. Manual control of the harmony pitch–shifts (± one octave) is also possible via the Shift sliders, while the Q button forces these shifts to the nearest half–tone. If automated, these sliders could be used to provide real–time pitch–shifting for special effects. The Humanise slider adds an element of both pitch and time variation to a harmony performance, while the Formant slider allows the character of the voice to be adjusted (a 'gender' control) — and both can help create a more natural harmony. 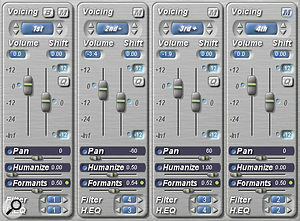 Finally, the Filter and H.EQ controls each provide a set of 10 preset tonal settings. The Filters vary from simple high– and low–pass types to band–pass and comb filters, while the Harmonic EQ presets interact with the pitch of the input signal to introduce some subtle tonal variations into the performance. The large blue Voicing Display indicators at the top of the channel strips indicate what harmony position and octave each channel will generate.A full configuration for all the settings of the four Harmony Channels can be saved as a preset in the Preset panel. Mu Technologies supply some 30 presets to get you started, and 60 slots are available in total. As described below, switching between these presets can be automated. The Chord Panel allows the harmony key and chord combination to be specified. Clicking on the MIDI button brings up a miniature keyboard display and, providing your host allows a MIDI channel to pass data to Mu Voice, Mu Voice will automatically recognise chords played via a MIDI keyboard. Up to four zones can be identified: from left to right, the first zone allows the selection of the key, the second is an area for chord input, the third is where notes can be used to select one of Mu Voice's harmony presets (from the Preset Panel) and the fourth provides a means of moving through the Chord Scheme Panel (more on this shortly). Clearly, users could simply record a series of chord and harmony Preset selection options on a MIDI track to automate the required changes through a complete song. However, it is also possible to build a sequence of such changes in the aforementioned Chord Scheme Panel. Using the Insert buttons within either the Chord Panel or the Preset Panel places the current chord or preset into the selected 'slot' in the Chord Preset Panel, allowing the creation of chord and harmony preset combinations. The timing of the transition from one slot to the next can be synchronised to the host by engaging the Write button and simply using the cursor keys to step through the slots as the song plays back. As this automation is created, the timing of each transition is displayed at the top left of each slot. This manual automation is very easy to use, but for most competent keyboard players I suspect the MIDI approach might be the preferred route, especially as harmony presets and the contents of the Chord Preset Panel sequence need to be saved, as they are not part of the host sequencer project. Finally, the Analysis panel, in addition to global volume and pitch–shift controls, provides the Range and Inversion controls that adjust the way Mu Voice detects the pitch of the incoming audio — although I found the default settings worked well enough for most material. The Impact slider controls the degree to which Mu Voice corrects the pitch of the incoming audio, while the Mode button switches between chromatic and scale based pitch–correction. The Chord Panel allows the key signature to be set (in this case to A major) and automatically displays a diatonic chord series for that key, to allow chords to be inserted into slots in the Chord Preset Panel.In terms of simple pitch correction, Mu Voice doesn't offer enough flexibility to be a serious competitor to Auto–Tune or Melodyne but, in most cases, the correction is done fairly transparently, providing the original performance was itself reasonably competent. Artifacts only became noticeable at very high settings of the Impact slider. For harmonies and automated double– or triple–tracking, meanwhile, Mu Voice can produce really good results. As with most real–time pitch–shifting, the harmony voices sound more convincing if kept within a single octave of the original. That said, when used in a full mix Mu Voice sounds very good and, because of the way the engine builds the individual parts based upon key/chord combinations, the results are very musical. The Humanise and Formant sliders can really help to give the results a more convincing character, but I found the Filter and H.EQ settings to be a bit more hit–and–miss. While they do alter the tonal character of the voices (which is useful), I suspect some users would have preferred more conventional EQ controls on each channel. 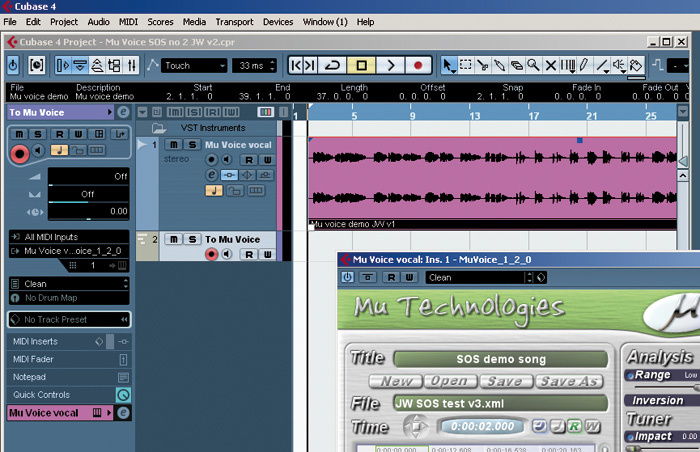 In testing with Cubase 4, the plug–in behaved very well and proved easy to use. The MIDI control options were only added in version 1.2.0 but seemed well implemented. Given some practice, MIDI could be used to trigger Mu Voice in a live setting. An option to bypass the chord recognition and base harmonies directly from the MIDI notes played would be nice to see (perhaps something for a further update? ), although this would require the user to have a greater knowledge of what notes might produce a suitable harmony. The MIDI button in the Chord Panel brings up a MIDI keyboard display, within which zones can be defined for MIDI automation of key, chord and harmony Presets.My only other observation concerns how Mu Voice currently handles situations where the original lead vocal has a particularly wide vibrato. In testing, such vocal parts generated some very noticeable artifacts, both in pitch correction and the harmonies, and I suspect the engine was simply struggling to decide which way to pitch–shift. In the majority of cases, this is unlikely to be an issue but, for comparison, the same wide–vibrato vocal is dealt with more smoothly in Antares' Harmony Engine plug–in (see the 'Alternatives' box opposite for further details). 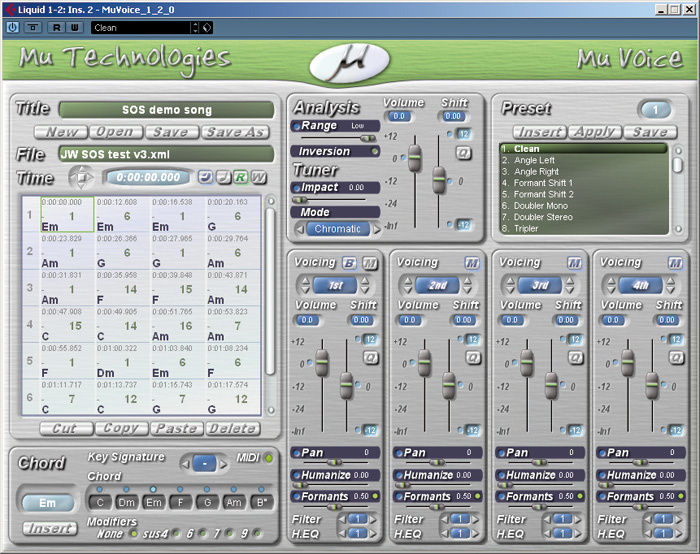 In most cases, the audio quality of the harmony parts generated by Mu Voice is perfectly acceptable in the content of a full song arrangement and, because the harmonies are based upon the plug–in's chord-recognition system, the user doesn't need a Ph.D in music theory to construct something musically credible. In terms of raw audio quality, however, the output from Mu Voice is perhaps not quite up to the quality of the best of the TC–Helicon/TC Electronic hardware range, and Antares' new Harmony Engine provides some stiff competition in a plug–in format. Whether Mu Voice can compete against these established players remains to be seen, but Mu Technologies' main man Wim D'haes has already shown that the company are capable of a rapid development cycle. For a first release, Mu Voice shows considerable promise and, if you are searching for a convenient and easy–to–use solution for creating backing vocal parts, it is well worth auditioning. Hardware alternatives to Mu Voice are provided by both Digitech and TC–Helicon, and SOS has reviewed a number of products by these companies in the past. However, given the plug–in format, a more obvious comparison would be with the TC–Helicon/TC Electronic Harmony 4 and Antares' Harmony Engine plug–ins. The former is only available for the Powercore system and Pro Tools HD, but uses the harmony processing from TC–Helicon's top–of–the–range hardware processors, and the results can be very good indeed. Harmony Engine is a relatively new product and a very direct competitor to Mu Voice. I was fortunate enough to be able to test them side–by–side while conducting this review. Harmony Engine currently offers the user a wider range of options for controlling how the harmony is created and, to my ears at least, perhaps has a slight edge in terms of the audio quality. It is, however, slightly more expensive than Mu Voice. Capable of very decent harmonies given suitable vocal input. Results not so good when using vocals with a wide vibrato. For automated generation of double–tracking or harmony backing vocals with the minimum of user input, Mu Voice does a very solid job and is worth auditioning alongside the more established competition. 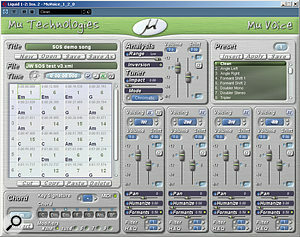 Mu Technologies Mu Voice version 1.2.0. PC with Athlon dual–core 4400+ processor, 4GB RAM, TC Electronic Konnekt 24D and Echo Mia 24 soundcards, running Windows XP Pro SP2. Tested with Steinberg Cubase 4.1.3.